NOTE ADDED OCTOBER 4, 2017: The property in Deep Run has changed ownership and the new owner is NOT allowing collecting or trespassing. The fossil-rich beds described in this note can no longer be visited. WCGMC will not schedule any more trips to Deep Run. Most residents of western New York carry on their daily business without any knowledge that they live in a region with some of the richest and most diverse fossil collecting in the United States. Those of us in the WCGMC are lucky to know how blessed with are with our collecting opportunities. But do we know the series of geologic events that led to this unique opportunity? There are other fossil-bearing stratigraphic units in New York, but here we discuss the prolific Middle Devonian Ludlowville Formation within the Hamilton Group. About 385MY ago an inland shallow sea occupied much of western New York and both the sea and the benthic bottom literally teamed with marine life. Corals (both rugose and tabulate), brachiopods, gastropods, crinoids, and, of course, those highly sought after trilobites thrived communally in the shallow seas behind the continental mass to the west and inboard of the Catskill Delta and Acadian Mountains to the east. Of course, they died also and the next requirement for fossil preservation is a rapid burial preventing scavenging and/or chemical destruction of the hard shell portions. This was helped by occasional catastrophic flooding events from the rapidly eroding mountains to the east. As a result, the stratigraphic column of the Hamilton Group is marked by several thin highly fossiliferous units, many of which are named for the dominant critter that can be found amongst the shale or limestone rock. But preservation of fossils only permit collecting if much more recent geology generates exposures where they can be collected. For this we benefit from two much more recent geologic features. First, the sedimentary units in western New York all dip just a bit less than 1 degree to the south. This means that progressively younger rocks are exposed as one travels from Lake Ontario to the Pennsylvania border. In fact for each mile south one climbs about 75’ in the stratigraphic column. 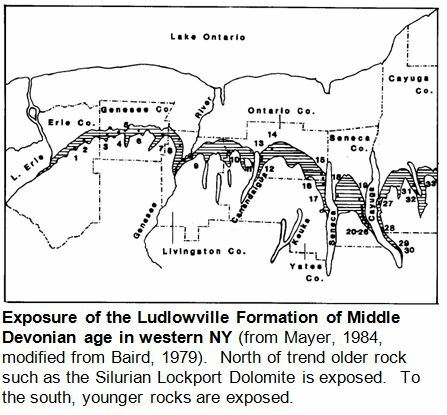 Of course it is more complicated than that because the surface is not flat, but the general progression is very evident in this map displaying the surface exposure of the Ludlowville Formation of the Hamilton Group. But we still have one more problem to overcome. As recently as 12,000 years ago western New York was covered by glaciers and when the ice sheets retreated they left the moraines, drumlins and other surface features with which we are all familiar. And they buried the Middle Devonian bedrock loaded with all those fossils. 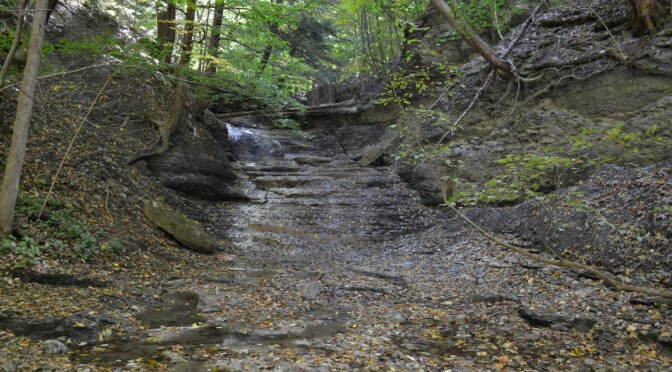 But glacial action also carved out the Finger Lakes, and erosion since has generated virtually an unlimited number of creeks, gullies, and gorges that cut down through the glacial cover to the fossil-bearing strata. All we need to do is search where those creeks enter the lakes or walk up the creeks to the source. One such location where this can be done is Deep Run Gully on the east side of Canandaigua Lake. At that location one can climb through virtually the full Ludlowville Formation starting with the Wanakah member and followed by the Jaycox member. The later is capped by the Tichenor limestone, a two feet resistive unit that is easily recognized as it caps the 20’ waterfall about 1500’ up the creek. Directly atop the Tichenor is the type location of the Deep Run member. The Tichenor capped falls is depicted on the cover photo in August, when water is at a minimum. All of these units contain fossiliferous units however the Jaycox interval immediately below the falls is likely the most prolific. Two separate coral-rich beds contain abundant horn coral (Heliophyllum halli) and many species of brachiopods. Although the horn corals are typically solitary coral in that they grow as individuals rather than in colonies, at this location and others along Canandaigua Lake they did grow in small groups. Finding a multiple is a special find (center photo below). 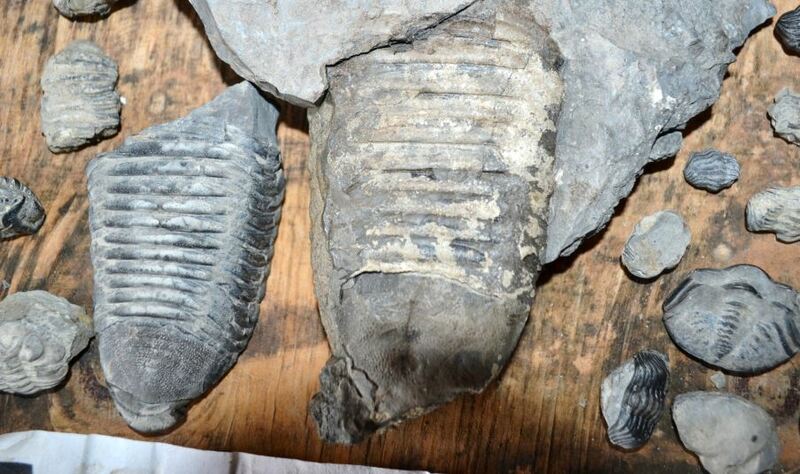 Of course, most who venture into any of the Ludlowville Formation sites are most pleased when they encounter any of the trilobite species that roamed the region. See right photo below and many of those depicted in the photo on page 1 from the Fossil Fellas bounty. Many are also from Deep Run. 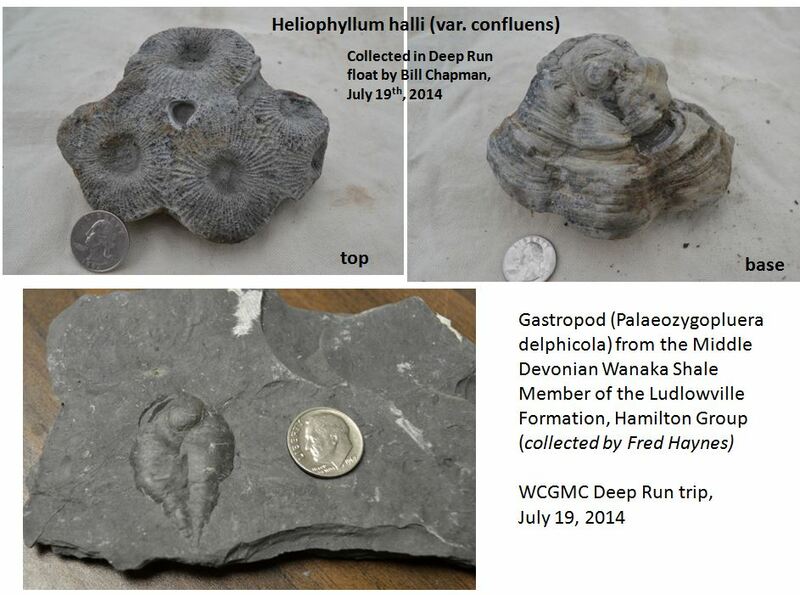 Trilobites are not as common as corals or brachipods in the Jaycox of Deep Run Gully. But when found they can be true treasures. The two large Dipleura dekayi thorax and pygidium were collected by the Underwood boys on one of their many treks up Deep Run. There is an interesting gastropod species that can be collected in the Upper Wanakah member. The Palaeozygopluera are severely compressed and appear somewhat uncharacteristic of gastropods (left figure below). The Upper Wanakah member represents a deeper water oxygen poor environment. ; Corals are absent and the unit lacks overall species diversity; only the gastropods and a few diminutive brachiopod species survived in the deeper water. This is on private property that is heavily hunted and the owner has a Rottweiler that is free to roam. I would not advise people to visit this location unless they contacted the owner. Thanks Julie. We also learned that in August. I should have thought to update my note on my blog to acknowledge that the ownership there has changed. I don’t see my comments here too often and just saw yours tonight. I have updated my 2014 entry. Thanks for message.